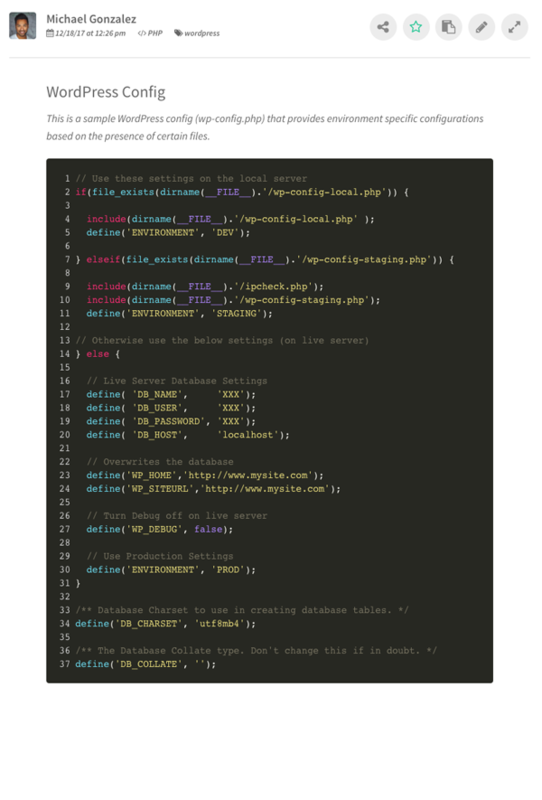 Code Snipper's web based platform allows you to have quick access to your code snippets at any time from anywhere with an Internet connection. Code Snipper currently supports over 30 of today's most popular coding languages with additional languages being continually added. 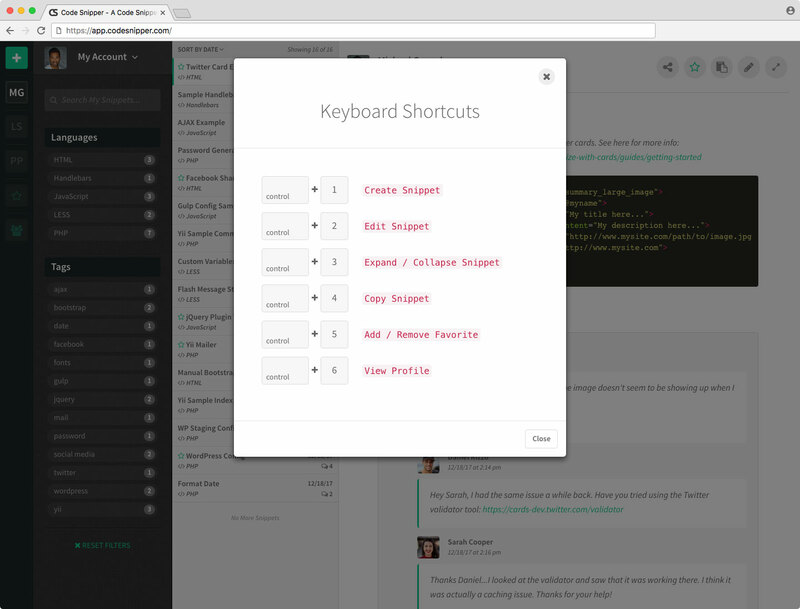 Each of the supported languages has built in syntax highlighting to make every snippet easier to read and understand. 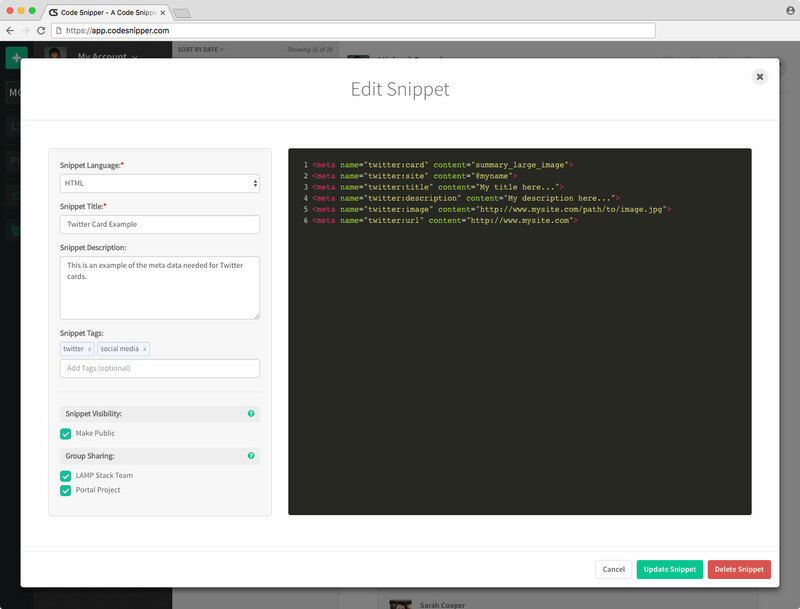 Code Snipper includes an extensive tagging feature allowing you to add one or more tags to each code snippet. This tagging feature not only provides context for the snippet, but creates relationships between similarly tagged snippets and provides a simple means for quickly retrieving these snippets from your repository. Code Snipper's search functionality parses through your entire library of snippets and returns snippet results relevant to the provided search term. Search results will include a comprehensive set of snippets matching against a snippet's name, description, or content. Not sure exactly what to look for but need to limit the scope? Leverage Code Snipper's expansive filtering capabilities to help narrow your search. Code Snipper allows you to filter by language, by tag, by favorites, and by group, as well as providing the ability to sort by date. 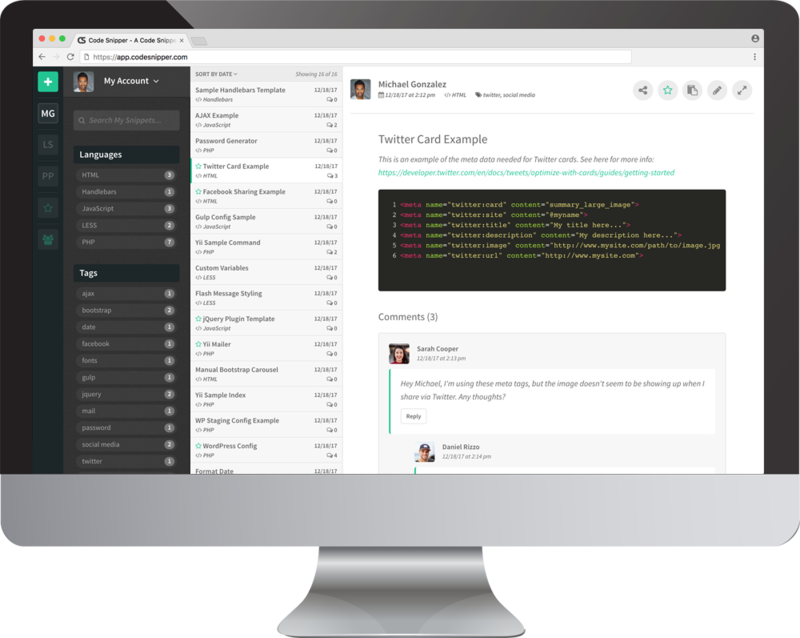 Whether it's capturing a dialogue through its commenting features, uploading coding templates, or leveraging the built in group functionality, the Code Snipper platform allows team members to collaborate on projects, products, and areas of expertise. Need to share a snippet with others? 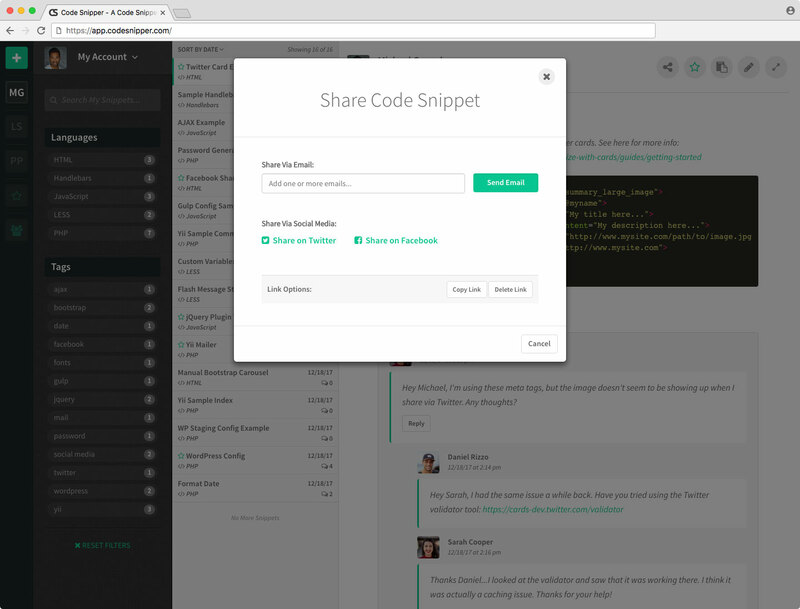 Code Snipper not only gives you the ability to share your snippets via Facebook, Twitter, and email, but also allows you to control when it's publicly viewable and by whom. All data transactions with the Code Snipper platform are sent via encrypted SSL communications. Critical user data, such as user credit cards, are properly encrypted and stored in accordance with PCI standards. Backups of all user data (e.g., snippets, groups, tags) are performed nightly to ensure data integrity and availability. We pride ourselves on our prompt customer support and are readily available to assist our user base. Have a question, feedback or comment? Please use our live chat feature located in the lower right hand corner or contact us at support@codesnipper.com. We are continually looking for ways to enhance our product and provide greater functionality to our users. Our current product roadmap includes support for several additional programming languages as well as the development of a pubic repository that our users may both contribute to and lend from. Not sure exactly what to look for but need to limit the scope? Leverage Code Snipper's expansive filtering capabilities to help narrow your search. Code Snipper allows users to filter by language, by tag, by favorites, and by group, as well as providing the ability to sort by date. Need to share a snippet with others? Code Snipper not only gives you the ability to share their snippets via Facebook, Twitter, and email, but also allows them to control when it's publicly viewable and by whom. 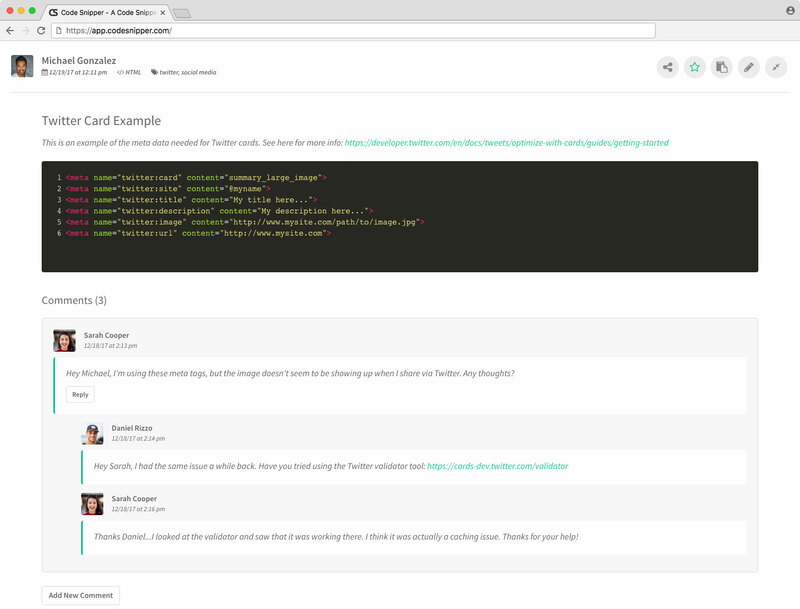 Take your development team to the next level with Code Snipper. Empower your team to work together more efficiently by allowing Code Snipper to organize the common code components your team leverages every day. How much time do you spend looking for old code examples? Digging through old projects to find a relevant example for a current project takes time. That's where Code Snipper can help. Begin organizing the code library that you've built up over the years. No confusing plans with a matrix of different options and support. We like to keep it simple. 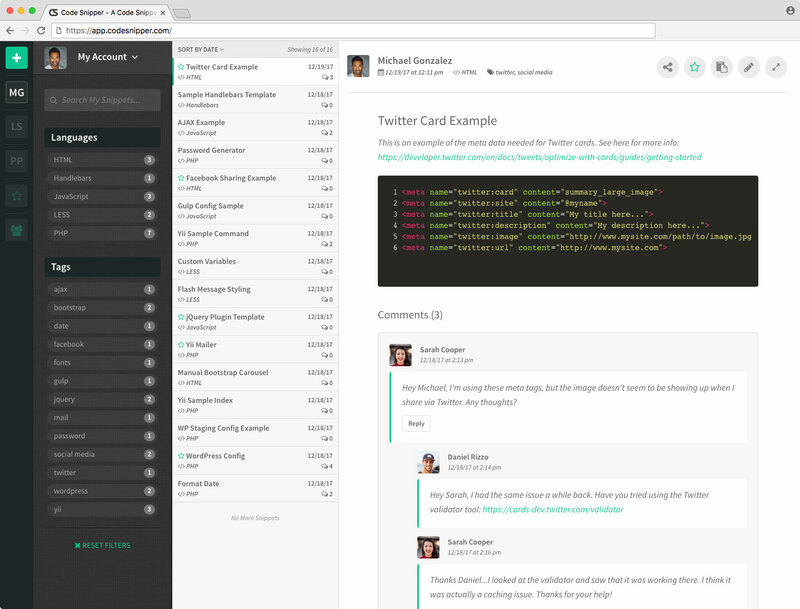 At just $5 per user, per month, get all that Code Snipper has to offer. 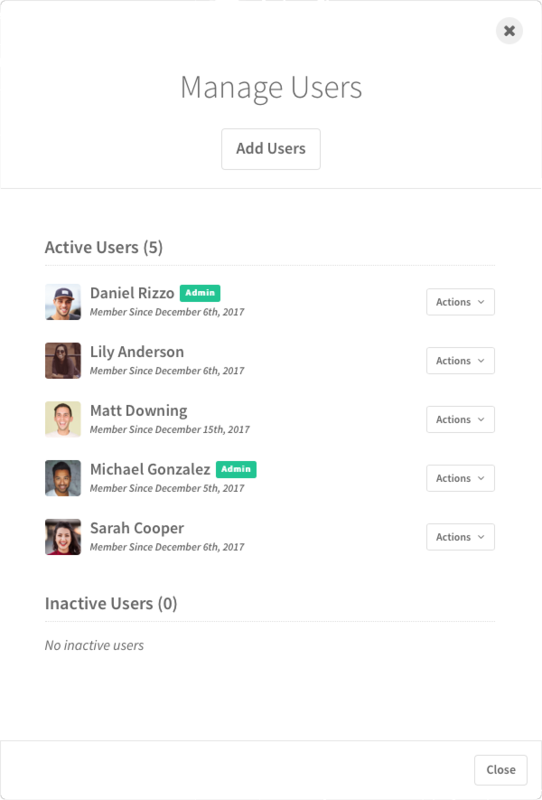 Add or remove users as needed. No long term commitments. Cancel any time. "Code Snipper has enabled my team to share and collaborate on their work while making our development process more efficient. Being able to leverage our library of code snippets has greatly improved the quality and consistency of our development." What is the difference between a team account and an individual account? 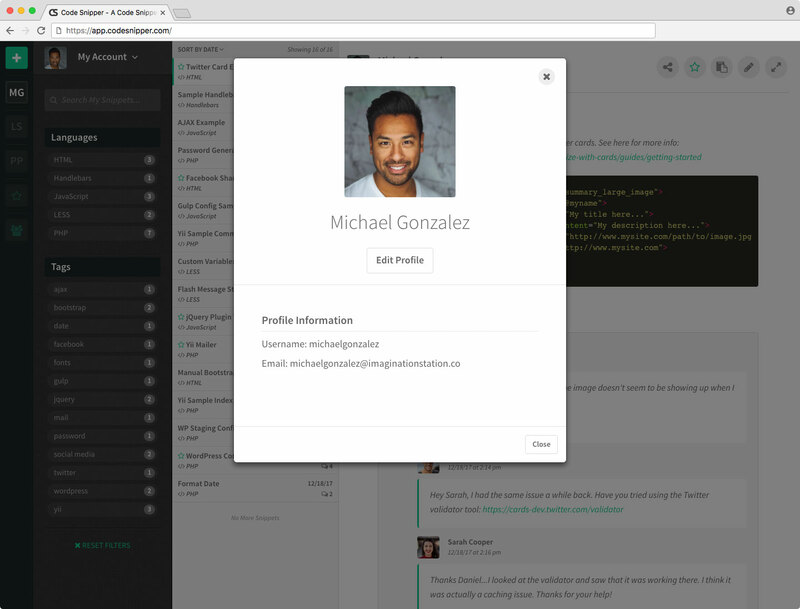 In addition to all the code organization features and other benefits of the individual account, the team account ties multiple user accounts together and provides an additional set of features for team collaboration. Included in these team features is the ability to create groups, organize code snippets by group, add comments to snippets, and reply to previous comments to facilitate a discussion. 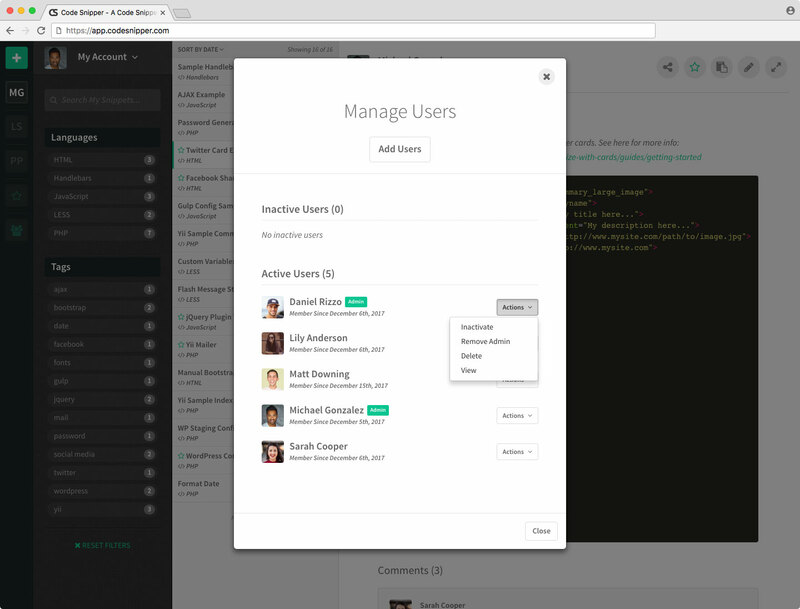 Additionally, the team account has a powerful user management interface allowing administrators to dynamically add / remove users to fit their team's needs. Can I switch between a team account and an individual account? Yes. Switching from an individual account to a team account can be done at any time by simply changing the account type in the account settings. To access this, click on the "Account Info" option within the drop down menu that appears when clicking on your name in the upper left corner. Once the Account Info modal is displayed, click the "Edit Account Info" button and then choose the "Team" option under "Account Type" and save by clicking the "Update Account" button. Moving to a team account does not change your pricing, however each additional user that is added after moving to a team account with be billed at the regular $5/month/user rate. Changing from a team account to an individual account is also supported, but must be done by contacting Code Snipper support. What type of support do you offer? We are here whenever you need us. Simply send us a message at support@codesnipper.com and our customer support representatives will promptly reply. What makes Code Snipper different than other code snippet managers? Do you have plans to add any features to the Code Snipper platform? Of course. While we are proud of the current Code Snipper capabilities, we are always striving to improve our product. Below is a brief list of some of the features we are working toward providing our customers in the near future. What languages does Code Snipper support? Code Snipper currently supports over thirty of the most popular coding languages today (see list below). Support for additional languages will continue to be added over time. If there is a language you need supported that you don't see on our list, please let us know and we will make an effort to accommodate. I have a question that's not listed here, how can I contact Code Snipper? The most efficient way to get in touch with our support staff is via email (support@codesnipper.com). Copyright © 2019 Code Snipper. All Rights Reserved.